To complete online enrollment, please go to https://www.envisionexperience.com/enroll and click on the button for ENROLL WITH STUDENT ID. Founded in 1992, the National Youth Leadership Forum (NYLF) is a tuition-based 501 (c)(3) nonprofit educational organization established to help prepare extraordinary young people for their professional careers. Headquartered in Washington, D.C., its mission is to bring various professions to life, empowering outstanding young people with confidence to make well-informed career choices. 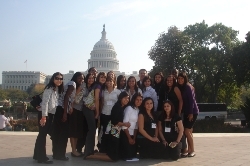 NYLF programs are held in nine cities throughout the United States. Forums are offered in a wide variety of career fields, such as defense, intelligence, diplomacy, law, medicine and technology. 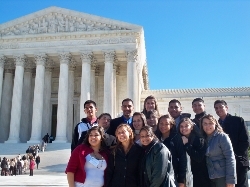 Over 100,000 high school and university students have attended NYLF programs. Participants are nominated to attend a program by educators, organization advisors, alumni, and participating institutions or through classroom surveys. Students may also be admitted through an application process. Program participants all demonstrate strong academic abilities, leadership and a strong interest in the career field being studied. NYLF is funded through student tuition and is proud to offer need-based scholarships. As being part of the Forum, students take part in a national security decision-making process. The students and their colleagues are assigned with roles of persons who play a part in making national security decisions. Some examples include the President, the Chairman of the Joing Chiefs of Staff, the National Security Advisor, the Secretary of State and many other significant players. In these roles, students debate the United States actions and reactions to hypothetical situations in different scenarios. · Will students have roommates? How many? Yes. To accommodate all of the participants, three or four students will occupy each sleeping room. Each student will have their own bed. · Can a student and friend room together or select roommates? No. Roommates request are not accepted. We strongly believe that learning about-and from-other young leaders from all over the country provides a significant networking and leadership development opportunity. · Where will students eat? Breakfast and dinner will be eaten at the housing location. Lunches will be eaten in food courts and cafeterias where the students will be visiting. Can students use the gym or swim in the pool at the hotel? No. In addition to safety and security reasons, students have a structured schedule throughout the forum and free time does not coincide with pool hours. · Is laundry service available? Most hotels will have laundry service for a separate charge. The Capitol Library of Congress Supreme Court The Industrial College of Command Forces Arlington National Cemetery Kennedy Gravesites Tomb of the unknown soldier Wreath laying ceremony Smithsonian Museums Korean War Veterans Memorial Lincoln Memorial Washington's Monuments: Franklin D. Roosevelt Memorial Thomas Jefferson Memorial and many more..
WATCH & ENJOY OUR ITA CLASS OF 2017 EXPLORE WASHINGTON D.C. & THE NYLF PROGRAM! MOVIE TRAILER AND SHORT MOVIE BELOW!